Needless to say, we have had to rely on the kindness of strangers a fair amount on our trip and the generosity and willingness we have experienced has been pretty humbling in all four countries we have visited so far. We have been pursued a kilometre down the road in Thailand just so our chaser could present a gift of fresh fruit; another guy in Vietnam took 30 minutes out of his working day to lead us back to the correct road after we got lost and whenever we have needed assistance with the bike swarms of people have always been eager to help us get back on the road. 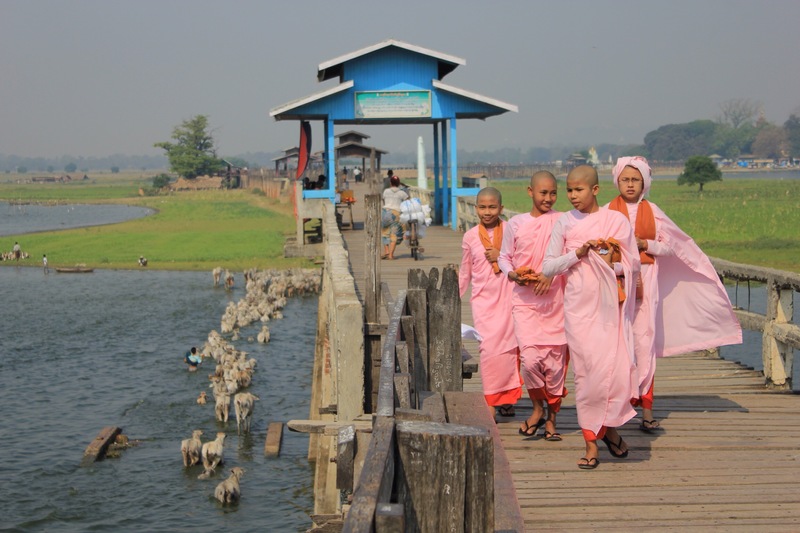 Nowhere is quite like Myanmar for this giving spirit. The past three days have involved us hitching 150km via 3 pickup trucks, taking refuge in a local monastery and being offered hospitality by a wonderful family in a remote village. 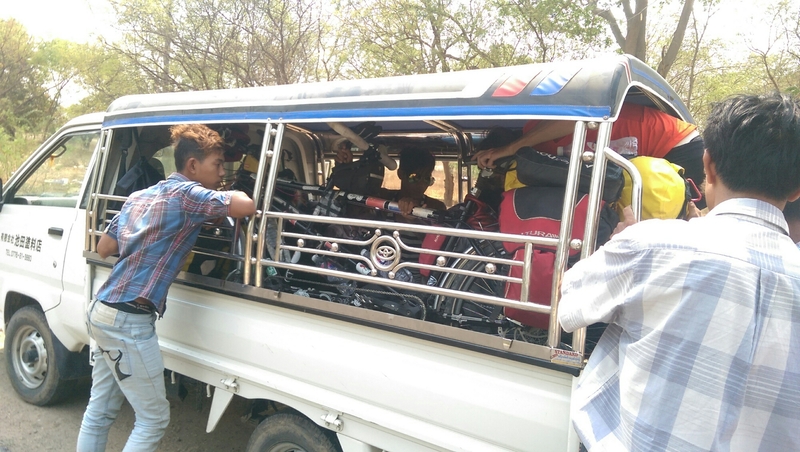 After leaving mum and dad in Bagan before they headed back to Yangon for their flight home we ended up hitching the majority of the way to Mandalay just 30km outside of Bagan. We started to hear a crunching and thought it sounded like the bearings in the bottom bracket so decided it was safer to get to a bike shop ASAP. The second ride was with two guys in a pickup truck who drove 15km out of their way to drop us off. It turned out that this truck made quite a spectacular detour south to pick up a large collection of sugar cane from a village which wasn’t even on our map. 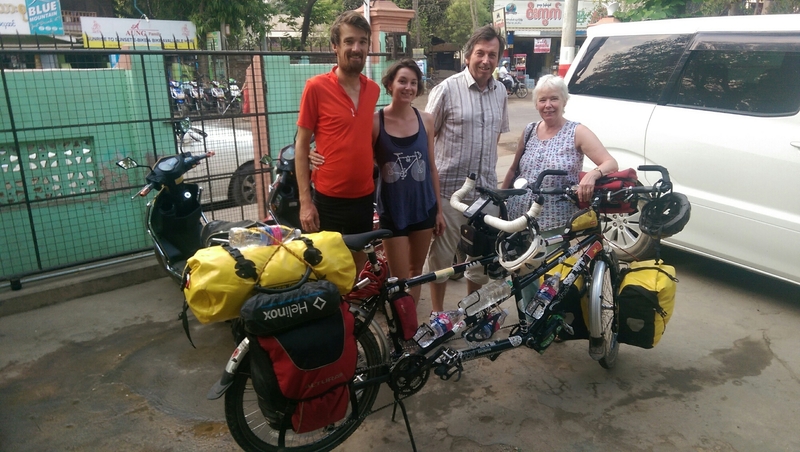 By the time the truck had been loaded and we had worked out that they were planning to tie the tandem and us (along with the family!) to the top it was 6pm. We managed to communicate that perhaps it was easier for everyone if we stayed the night in the village and set off early by bike the next morning. A young 25 year old called Ye Naing, who is studying at a local university, arrived and took Paddy to meet the village head and we were given permission to stay with the monks in the local monastery. Everyone was so friendly; we were taken to the river so we could swim and wash, fed a huge meal and then treated to an excursion in the head Monk’s car to visit the Werawsana temple which is the first pagoda made entirely from jade. 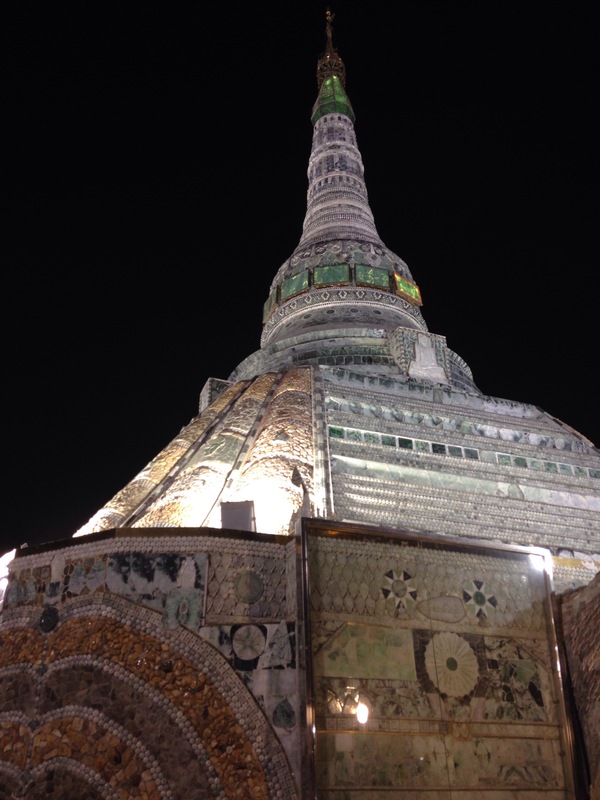 It’s a popular temple to visit at night, spectacularly lit up with peaceful gardens encircling the base. Here we are with Ye Naing, his uncle and some boys who came with us from the monastery. 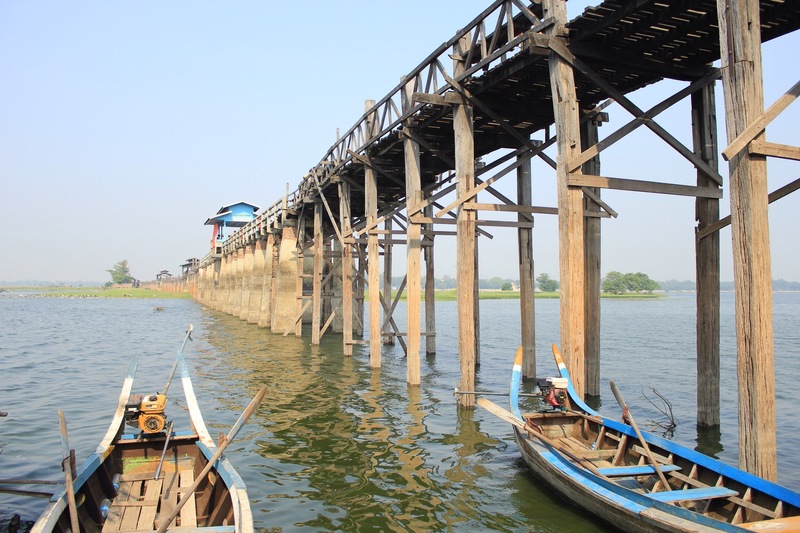 We slept well and after breakfast Ye Naing arrives and tells us he has arranged a lift for us to U Bein Bridge, the famous teak bridge in Amarapura, just outside Mandalay. He says we should visit the bridge as it is a good thing to see and then we can perhaps cycle the 10km into the centre to find the bike shop. We can’t argue with this plan but can’t help feeling that they are all going to so much trouble for us. 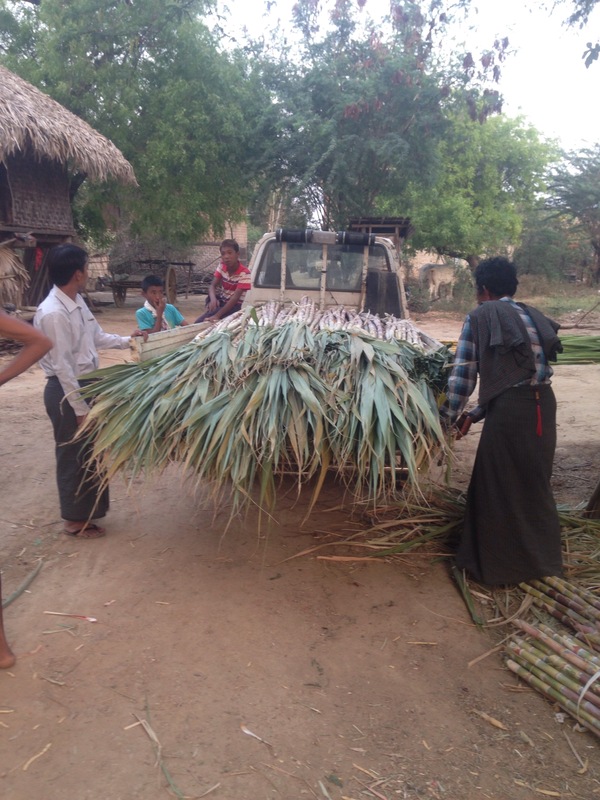 Ye Naing simply tells us they are very happy to help us. U Bein is pretty cool, and a great place for us to sit, enjoy the peaceful views and morning sunshine while thinking about the generosity we have just experienced. We take the bike to a workshop who give the bike a good service. Turns out the bearings are fine and the crunching was the back chain which just needed a thorough clean…! Onto Pyin Oo Lwin! 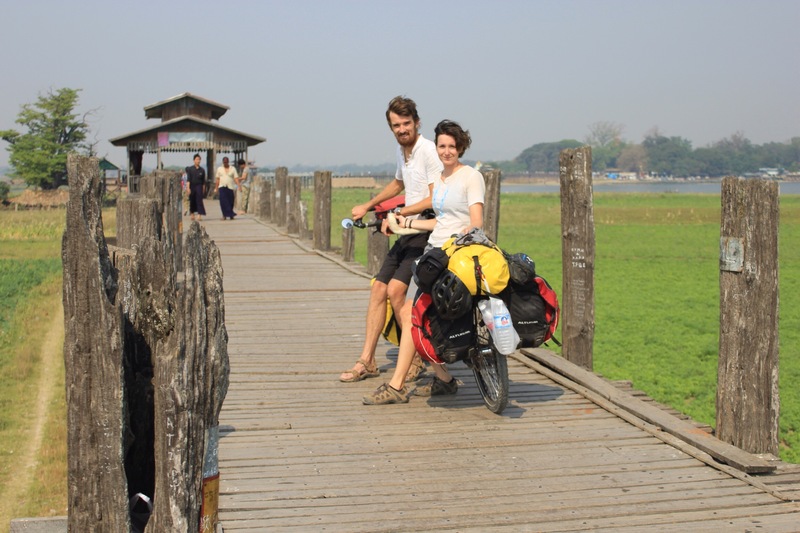 Posted on March 31, 2016 April 2, 2016 by annieandpaddyPosted in Myanmar, UncategorizedTagged bike shop in Mandalay, Cycle Touring, hitching with a tandem, Mandalay, U Bein Bridge.